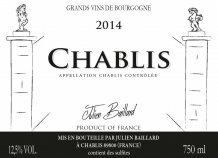 Domaine Baillard is a new name with a very long history in Chablis. Elodie Servin, the niece of François Servin can trace her roots back to the 16th century as the monks of Saint Martin mentioned the Servin family as owners of vineyards in Chablis. Unlike her more famous uncle, Elodie’s father, Jean focused on being a grower and selling his production to others. Following the marriage of Claudine Baillard (Julien’s daughter) and Jean Servin the estate of Julien Baillard was created. It started with 1.5ha and now is over 24 ha. In 2013, Elodie decided to start production under their own name and chose to continue to use the name Julien Baillard (her maternal grandfather) so as not to create confusion between her wines and her uncle’s estate. Today’s owners Elodie Servin and Kevin Van Noort are offering a part of the production in bottle. Elodie dedicates herself to viticulture and winemaking, and Kevin (her partner) to marketing and distribution. The 2013 vintage was the first vintage bottled under Julien Baillard estate. They started with Chablis 2013 and Chablis 1er Cru Fourchaume 2013. As they develop their market, production will expand to include the Grand Crus and increase the quantity bottled. With their family history, they hold some of the very best plots (old vines and location) in the 4 different AOCs of Chablis mentioned above. Uniquely, all of their vineyards are planted using a method known as “Selection Massale” instead of a clonal selection, in which cuttings from the best vines in the vineyard are used to propagate new vines instead of purchasing clonal vines from a nursery. Elodie practices sustainable farming with organic techniques. The winemaking is quite traditional: all in small stainless tank and just few barrels for Grand Cru and the Montmains. Domaine Baillard is working relentlessly to enhance the pure vibrant quality of Chablis. They have a tremendous potential and we are proud to represent them. The Chablis is situated close by the village of Chablis, Préhy and Villy. The soil is defined by alternating layers of limestone and clay containing marine fossils. Pale robe with light golden highlights, bright and glowing. Vivid nose reveals aromas of flowers and butter. The mouth is elegant, marked by a beautiful freshness. Our Chablis will accompany wonderfully seafood dishes, oysters, Escargot de Bourgogne or light cheeses. It will be perfect as an aperitif as well. 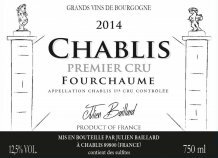 Our Chablis has an aging potential of 3 to 5 years, but can also be enjoyed young. The Chablis is situated close by the village of Chablis, for this cuvée – mainly in Préhy in the plot of “Les Pargues”. This type of soil is defined by alternating layers of limestone and clay containing marine fossils. The vines average at about fifty-five years. A golden yellow color with limpid highlights. Nose exhaling scents of citrus and butter. The palate is round and fatty, perfectly balanced acidity. The finish is fresh and sublimated by mineral touches. Our Chablis “Vieilles Vignes” will perfectly accompany goat cheese and white meat in sauce. 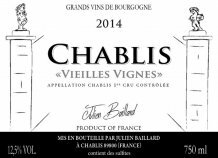 Chablis “Vieilles Vignes” is a wine that can be enjoyed over the course of the next 5 years. The 1er Cru Fourchaume is situated on the right bank of the Serein river close by the Grands Crus, and has an optimum South-West exposure. 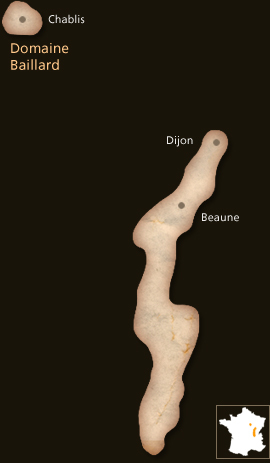 The area of this appellation covers 112 hectares and is situated on limestone soils of the Upper Jurassic Kimmeridgian era, rich in marine fossils and Exogyra virgula – small oyster typical of Chablis soil. Bright and fresh nose of white flowers and white flesh fruits. Mineral, has a floral side, round with a rich opulence. This cuvee will pair perfectly with seafood platters, oysters, Escargots de Bourgogne, charcuterie and cheese. Our 1er Cru is a treat for fans of young and fresh wines, but will be at its prime after 2 to 4 years. The aging potential is around 8 years. The vines are located on the left bank of the Serein, between Chablis and Courgis. Soils consist of limestone marl of the upper Jurassic Kimmeridgian area. Golden dress with green highlights. Clean nose exhaling scents of citrus and butter. Fresh palate, beautifully balanced acidity, great mineral finish. Our Chablis 1er Cru Montmains will perfectly accompany any fish and shellfish dishes, and will also pair well with poultry in sauce. Chablis Premier Cru Montmains can be aged up to 7 years.